While cruising around for a recipe for a raw, apple-pie smoothie today (how many other people use Google as their main cookbook? :), I stumbled upon Karen Knowler's blog, and after checking out her (okay, actually Nina Dench's) recipe for it, I browsed her homepage and found her recipe for Spiced Hot Chocolate. So, as a snack for the family today, I tried it out. 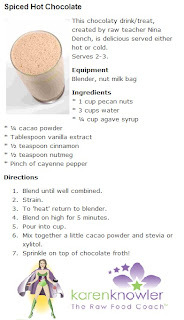 I'm surprised that it didn't occur to me earlier to write up a recipe specifically for raw/vegan hot chocolate, since technically we've done it before in our house by first making almond milk, then using that milk further to make hot chocolate. This seemed different, though, because of the spices and because of the fact that it uses pecans to make the nut milk, all at once. Anyway, like I said before we tried it - and it turned out to be much more delicious than that which we normally make with almonds. I imagine that's because pecans typically seem to feel richer than almonds - but that's also just my opinion. 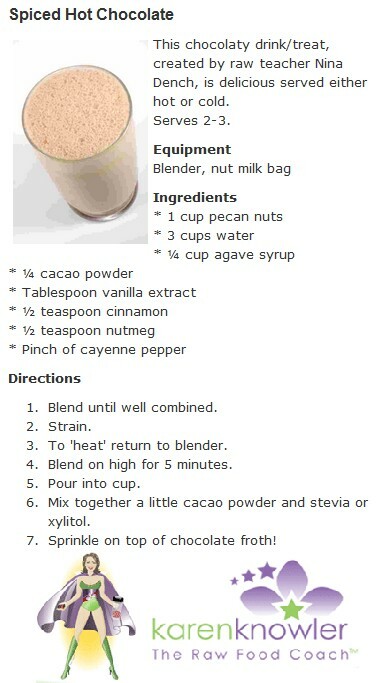 I've not used pecans to make milk before - but I've used them in smoothies many times. I'm not sure whether it would be healthier or not to soak them for a period of time beforehand like almonds, but I imagine it so. Throwing it all in the Vitamix was particularly easy, of course, but then the recipe took a turn for the worse - or more difficult, at least. Straining the mixture through a nut milk bag while it had the chocolate and syrup (we used maple syrup, incidentally) made it much more difficult to separate than when I've pressed our almond milk. However, eventually I separated it out into the chocolate-pecan nut paste and the milk. The recipe didn't mention the leftover paste, but we never throw that stuff out. Normally, with our almond milk, I immediately make up a batch of almond waffles which the kids absolutely love - but this seemed more like something I'd rather spread on toast, like a homemade Nutella. I tried it, and finding it rather bitter I added another 1/8th cup of maple syrup to the paste and tried again - perfect. So much so that the entire family swarmed around and commenced on a mid-afternoon snack of toast with "Nutella" and hot chocolate. Approval came from all sides, adults and children included. This recipe will certainly be used again in our house - but next time, I'm putting moving the mixture from the Vitamix to the Hurom Slow Juicer to speed up the process and do it better at the same time. Yum!